After winning game 7 of the World Series in 2002, John Lackey had two very mediocre seasons for the Angels. It was looking like 2005 might not be any different as he had an 8.27 ERA after his first three starts, but he managed to do a complete 180 and went 13-4 with 3.06 ERA the rest of the season. Despite his great season, not everyone seems to be in agreement on what the future holds for Lackey. Let’s take a closer look and see if there’s any reason to think he’ll revert to his pre-2005 form. 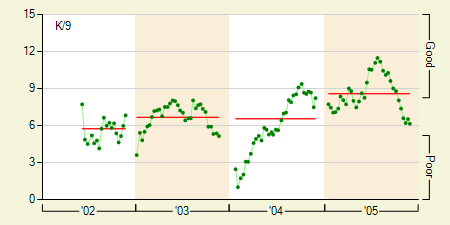 Starting with his strikeouts per 9 innings (K/9), you’ll see that he was already laying the groundwork for a breakout season back in 2004 when his strikeouts slowly climbed towards elite territory. In 2005 he picked up right where he left off and by mid-season he had reached some pretty insane strikeout levels. It’s worth noting he did slow down a bit towards the end of the season, but overall he had the 5th highest K/9 of any starting pitching in the American League. 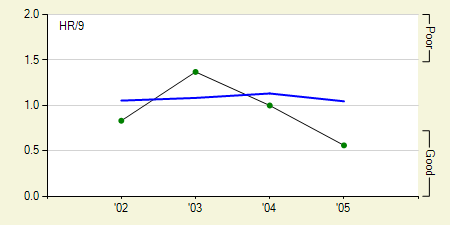 His control has always been decent as his walks per 9 innings (BB/9) have remained pretty flat his entire career. However, his home runs per 9 innings (HR/9) are a completely different story. In 2005 he allowed only 13 home runs which made for an extremely low home run-per-fly ball of 6.6%. Typically the league average is near 11% and it’s almost a certainty he’ll regress back towards the average. On the other hand, he did have a batting average on balls in play (BABIP) of .333 which was a bit high, so chances are that will also regress a bit back towards the league average. When you take everything into account, it seems clear that Lackey’s breakout season wasn’t a fluke. I could see his home runs being more of a problem if he didn’t pitch in Anaheim and if he wasn’t a ground ball pitcher. 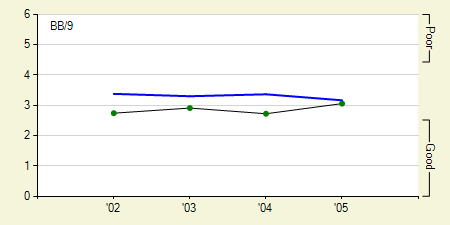 Hopefully any decrease in BABIP will counter any increase in home runs. His late season decline in strikeouts will be something to keep an eye on, but I honestly don’t think there’s much to be alarmed about here. I fully expect him to repeat his 2005 season. We hoped you liked reading Daily Graphing – John Lackey by David Appelman!